I think they are plotting and planning out their attack - and I'm scared because there's nothing I can do about it. You see, I grew up a dog person. We always had dogs running around from the time I can remember. In fact, I don't recollect anyone close to me - friends or family - with cats as family pets up until a few years ago. So to make this story more clear, I do not speak cat. Let me take you down memory lane to explain and hopefully proverbially show you how little I know about these furry felines. I'm not quite sure how this all will help with the story exactly, but I think I'll have a point by the end of this post. The first dog we ever had (that I can remember) was a husky called Shebangs or something like that. I was quite young, maybe five or six, but we got her from a friend of my father's while his family went away on holiday. She ended up staying with us for quite awhile....until she ran away. Or at least that's was what we were told. Mind you, I do remember Mom telling me how often she'd escape from the house, so perhaps there's some truth to this story. The next dog we adopted was a English Pointer named Jake. He was a gorgeous grey dog with softest coat and kindest eyes, but very skittish and super active. I grew up on farm-ish land, so there were always wild animals as well as domestic running around, teasing and tormenting him while on his leash. They usually got the best of him until one day a flock of wild turkey strolled through. He had had enough of their shenanigans, broke loose, and chased them across the road where he was hit by a passing car. The worst part about it was my brother and I saw the whole thing happen - and I still recall it doing so in slow motion. It was awful and I never fully recovered. I still think about him. Dogs were just always...there. If a cat came up to me, I was instantly on my guard. I didn't know what to do with myself - or them. I imagine I must look like those people that are handed a newborn baby and know nothing about how to actually hold a baby. And if I'm totally honest, my mindset was that dogs wait at the door for the owner to return home; cats hiss at them. Dogs are so loving, cuddly, and loyal; cats are aloof, guarded, and super finicky. Dogs are man's best friend; Man is cat's personal servants. So you see, cats were never part of the household equation. Despite the fact there were many stray cats about, we didn't adopted them as our own. We never wished them harm and often fed them scraps or nibbles, we just didn't bond with them as most people would. I suppose it was because we always had dogs to fill the animal void. Funny enough, my husband isn't a dog lover. In fact, his story is opposite to mine. They only had cats. Once our littles came along, they didn't make it any easier because my daughter wanted a kitten; my son a dog, although he would have been pretty chuffed with a pet elephant. Finally, this past October, fate decided for us. My Mum-in-law came over to our house, telling us about these poor cats that were abandoned in a home north of us, just outside the city limits. Apparently someone dumped them and took off. Seriously?! To treat any living creature this poorly is disgusting, cowardly, and inhumane. To make a long story short, I saw a photo of these two cat babies and fell in love. Me. Fell in love. With cats. Something about them and their story broke my heart or maybe I'm just getting softer in my old age, I don't know. All I know is that I needed them to come home. Within two hours, we went from being a non-feline family to these beauties exploring our home, making themselves comfortable. The woman who found them and temporarily took them in did much of the legwork so someone would take them. She told us that if no one stepped up to the plate, they weren't guaranteed a future. And there's no way I could allow that to happen. 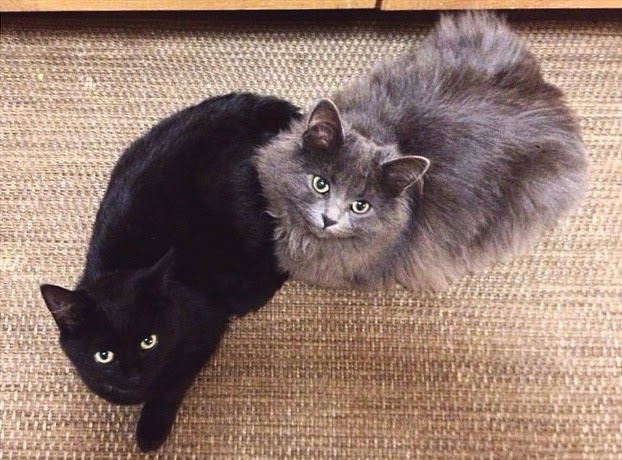 So that's how Sophie, our black short-haired domestic and Chloe, our grey long-haired domestic, came to be part of our family. Now just over two months later, the power seems to have shifted ever so slightly. You know what? Let's call it what it is. These cats rule the house. They fully spread out on our bed or sofa and make us feel so guilty if we move them. They pounce on any one of us at full force, without warning - especially Sophie and especially at two o'clock in the morning. They come alive in the middle of the night for some odd reason. Imagine my surprise to find she had climbed up the Christmas tree and propelled herself at me when I got up to turn the light off. It was terrifying, folks. If that's not bad enough, I wake up most mornings to find her sleeping on my face, suffocating me. They weasel their way onto our laps at dinnertime and help themselves to whatever were eating, nipping at us if we tell them otherwise - especially Chloe. She's my eater and I swear to all things crunchy and delicious, she's also part ninja. She can be sitting on the upstairs landing as I pass, but as I make my way down into the kitchen, I'll grab something from the counter, turn to leave or chuck something in the garbage and she's RIGHT. THERE. in the middle of the floor, staring at me with perfect posture as if she'd been sitting there all day. Like, how'd she get there so fast? Ninja cats are real, folks. She also demands food at any given hour, despite the fact there's kibble for both of them to graze on anytime they want it. But nothing....NOTHING is more unnerving than the staring. Omigarsh, the nonchalant I'm-gonna-kill-you-when-you-least-expect-it stare. They'll stare at us for hours; waiting, plotting their moment. I'm convinced. So I ask you this again....Why?!? WHY are my cats trying to kill me? AND WHAT IS IT WITH CATS AND BOXES? 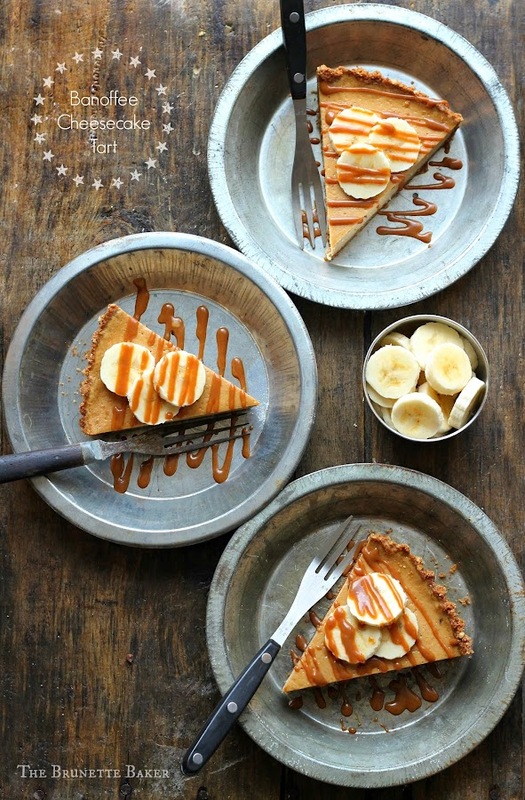 While we figure this out, why don't you join me for this Banoffee Cheesecake Tart. Unless the cats eat it first. But that's okay, because for the record, I honestly wouldn't have them any other way. Preheat oven to 350ºF. In a food processor, blitz gingersnaps and pretzels together until finely crushed. Add in sugar and melted butter and mix until fully incorporated. Press crumb mixture into a 10-inch tart pan with removable base, covering bottom and sides. Place in oven and bake for 8 minutes. Remove from oven and allow to cool. In a large mixing bowl, beat together cream cheese and sugar. Add in eggs one at a time and mix well. Add bananas and dulce de leche and blitz until fully incorporated and mixture is creamy and smooth. Pour into prepared baked crust, smoothing over with an offset spatula to ensure an even surface. Bake for 50-55 minutes or until centre is almost set. Remove from oven and allow to cool completely. Cover in plastic wrap and place in fridge to chill for several hours before cutting. In a small saucepan over medium heat, gently stir dulce de leche and heavy cream together until combined and forms a nice ribbon effect. You don't want it to be too thin or too think. It should nicely run off the spoon. Add more cream if needed. Once ready to serve tart, add sliced bananas and drizzled warm dulce de leche sauce over top. Those are just the cutest cats in the world. 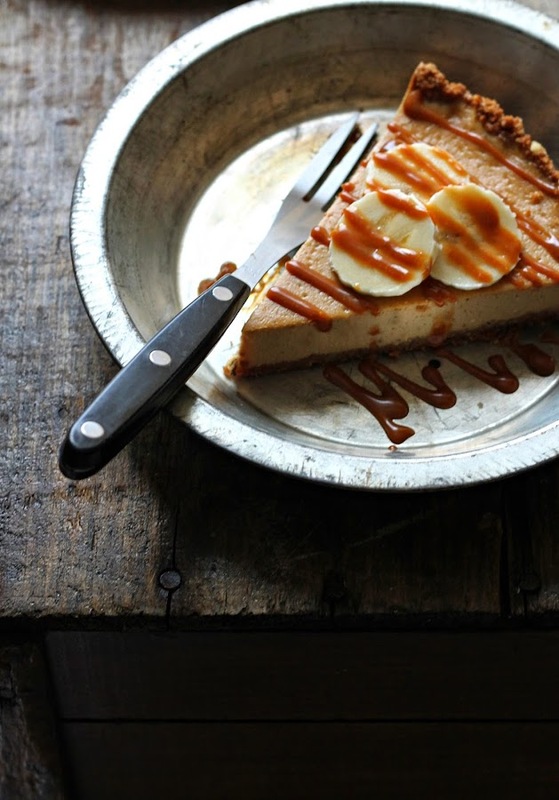 Delicious banoffee cheesecake tart too - wish I had a slice! I've never been a cat person either, but I probably couldn't resist rescuing those two cuties. Good lucks with them!! At least you have pie to sustain you? Looks great! THIS LOOKS AMAZING! I love Banoffee Pie and your take on it is clever. It's looks like so delicious. Great recipe, thanks for share.